Today, I have TWO cards for you! The top one is for TWO challenges. #1 is using our Sponsor from the Belli Challenges - QKR STAMPEDE. They were SO generous and sent each of our Design Team members three images each. So we wanted to give them an extra shout out. FAST DELIVERY and excellent service! Esther 4:14 “For if you remain silent at this time, relief and deliverance for the Jews will arise from another place, but you and your father’s family will perish. And who knows but that you have come to royal position for such a time as this?" 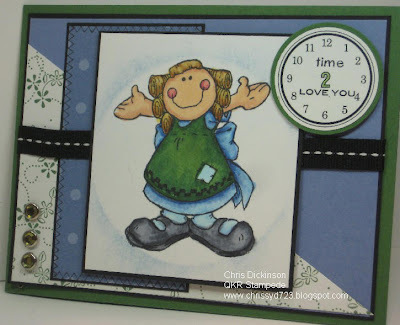 CHALLENGE: Make a card or project using a time piece or in some way denoting time or the passage of time. Let imagination be your guide! I recently went to a Scrapbook store here in the Racine area and bought some SMOOCHES - Have you tried that yet? I saw them a few months ago and thought about buying them but didn't take the plunge until this weekend because Technique Junkies had a technique in their newsletter using them! I have a busy day ahead of me - I hope you enjoyed checking out what I created! Thanks so much for stopping by! Have a WONDERFUL day! Hello again! 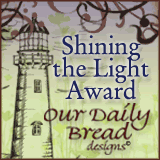 What an honor and day of excitement to go over to the Our Daily Bread Designs blog and see one of my creations and my name highlighted as receiving the Shining the Light Award. Thank you to ODBD for such a wonderful blessing and choosing me for Shining the Light Award! Todays Challenge from ODBD: Since it is February and we are acknowledging national hero’s (President’s day) or people who are special to us (Valentine’s Day) in the U.S. , the challenge team is challenging you to acknowledge and case a crafter you admire or a creation you admire changing just two elements to make it our own. I hope I am not disqualified from the challenge for adding TWO more! :) If I am...let me know and I can make another project! 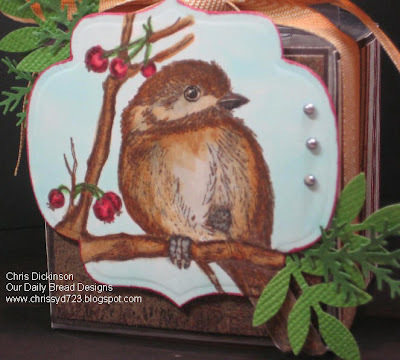 I chose Chris as my inspiration based on MORE than just her Paper crafting talent - I chose Chris Olsen as my inspiration because she has allowed her light to shine in many different venues. She always has an encouraging word and has gone out of her way to be extra kind to me. I do not know Chris, outside of blogging and the love she has for the LORD, that she has shared through blogging...I feel she has shared the love of Christ through her actions and kind words too. Thank you, Chris! While I was stamping today, I accidentally grabbed my brown Memento ink pad instead of black and didn't really like it - but decided to go with it anyways and not waste my card stock. As I was coloring this sweet bird, I wanted to add a little more dimension to the eyes and the beak, so I grabbed my black marker and outlines the edges. Well, I am very tired from a late night last evening and am ready to call it quits for the day! I hope you have a blessed week! Thanks so much for stopping by! Hello! We are under a Winter Storm Watch here in Wisconsin with a possible 6-9 inches. I am hoping for 9 inches! Really! If it has to SNOW - make it PRETTY! I grow weary of the brown/ gray look outside with muddy looking snow. NOT PRETTY! 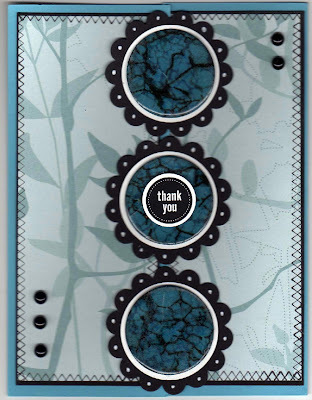 The card I created today is for the Mo's Digital Pencil 2 Challenge #19. 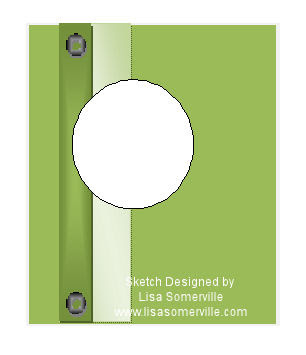 Use white or cream cardstock, your image from Mo's Digital Pencil, and one ribbon.. it's that simple... and, no additional layers! This month they have a spot opening up on their Design Team and you have to participate in their challenges all month - so I am in love with Mo's images and would LOVE to join their DT! This is my little cutie pie snuggling with a cat who desperately wants to get away... REALLY - he wants to get away! 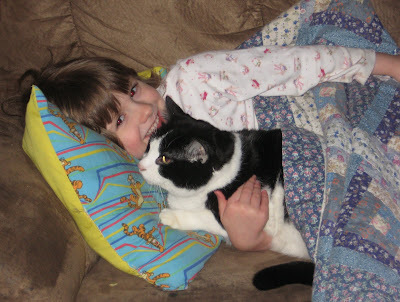 LOL Mo's image of the cat and the little girl are really and truly what our household often looks like! OK - I am now ready to go wash my face, change from my church clothes to some comfy cozy clothes and move to my office to create! Thanks you for stopping by! Have a blessed day!!! Todays card is one I made a few months ago for the October/ November 2009 Technique Junkies Newsletter called Faux Turquoise Stones. I just LOVE the effect of these Faux Stones - and turquoise is one of my favorite color! I have seen some cards with this technique using different colors that are just as beautiful! If you haven't tried this technique - give it a whirl! 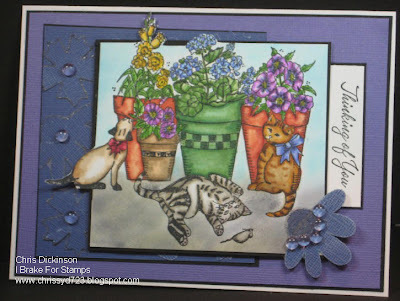 If you have not tried the TJ Newsletter - it is WONDERFUL - step by step WITH pictures directions and not only that - there are SOOOO many talented stampers that will inspire you with their work! I just LOVE it! Thanks so much for stopping by! Have a wonderful day and weekend. Hello! 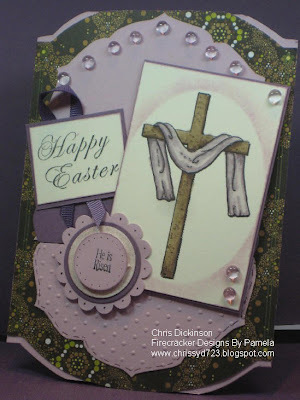 I am thrilled to have been invited to tag along on the Firecracker Designs By Pamela Design Team's Blog Hop! I will "officially" start on the Design Team as of March 1, but hopped on board for this blog hop just for FUN! 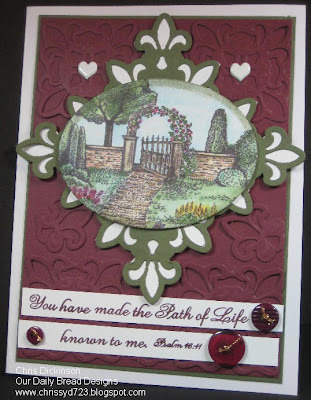 Welcome to the ROMANTIC LYRIC themed Blog Hop for Firecracker Designs By Pamela and my Bloggers Challenge post! Now that you are all ROMANCED...A note about the Bloggers Challenge! 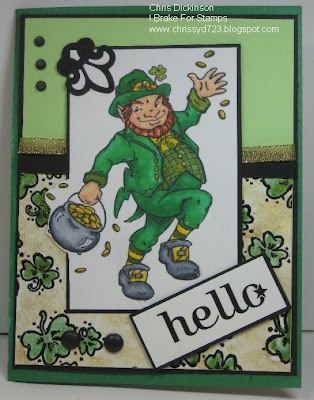 This weeks challenge is to create a card using the sketch below. 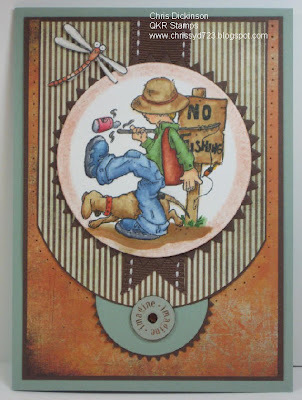 Now, to continue the circle, you will need to hop on over to the talented DONNA MOORE's BLOG and keep going until you’ve come back to where you’ve started! Thanks so much for playing along with us and we hope you have a great time! Hello! I had some time to play on Wednesday while my gremlins did school. I normally stamp or color with them while they do school. I get interrupted a lot, but it is something I can do to fill my time. I used Technique Junkies Wisped Frames tutorial too! Here are a few more details! 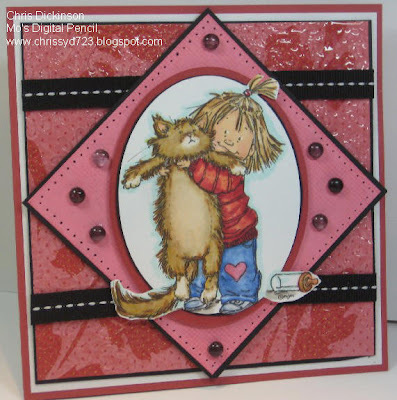 Tomorrow, I will be HOPPING along with Firecracker Designs By Pamela - so come ready for some ROMANCE and an announcement! Thanks so much for stopping by! Your comments make me SMILE! Have a WONDERFUL day! We are SO thrilled over at the Belli Challenge Blog this week, we had a record breaking 271 players! WOW! Thanks so much for spreading the word. And if you have NOT played along with us in the Belli Challenge... COME JOIN THE FUN! This week, we have a FABULOUS Sponsor - QKR Stampede - (they also own Eureka Stamps and Biblical Impressions) and they are giving away a generous $30 worth of rubber stamps - Your choice to one lucky winner who participates in the Belli Challenge! I used Microsoft Word to type up the sentiment, which is one I utter (heehee) quite frequently since I have been dieting - Get it? 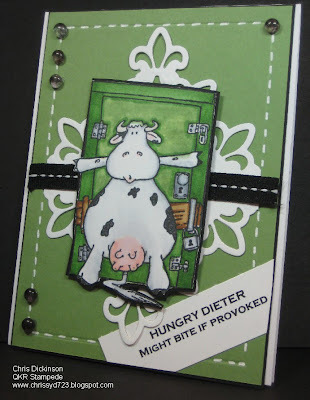 Utter = Udder. Okay...I am over tired as I type this, so easily amused... bear with me as I finish writing this up. My second card fits the bill though! Be sure to check out the rest of the Belli Design Team's Blogs - they are sure to inspire you! Come join the fun on the Belli Challenge! We WANT YOU!!! Thanks so much for stopping by again! Have a great day! Hello! Yesterday while my children did school, I colored. :) I try to do fairly simple things while they do school so I can be "available" to help them as they need help. I am in a constant state of organizing my office and cleaning it out these days. My sweetie bought me some new cabinets, so he hung them in my office and I was able to remove the big table. That freed up extra space and I decided to get rid of a few more things. Now, since I was able to free up that space, I decided to pull my Cricut out of its box and use it! Imagine that! Using something I bought! 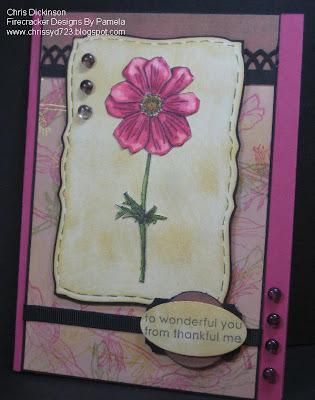 lol Using the Garden Font, I cut several flowers out to create my MONO DIES background! MONO DIES is a technique from the latest Technique Junkies Newsletter! 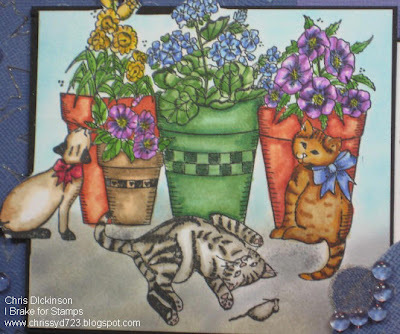 I colored this sweet image called Playful Kittens from I BRAKE FOR STAMPS. This image is SO afforable and FUN to color! Thanks so much for leaving me comments. I love hearing from you!!! Have a blessed day! Happy Monday Friends - I hope you had a refreshing weekend! I went scrap booking all day on Saturday and worked on some projects I will be sharing with you some time soon! 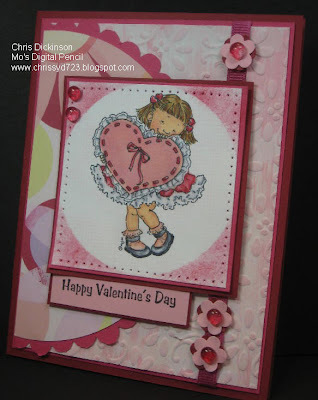 Todays project is for the Our Daily Bread Designs Challenge - we were to use red or pink and bling on your creation and it doesn't have to be a Valentine's themed project. I pray this Scripture bring you peace and comfort today as you read it. May you find refuge and strength and comfort in HIM today. 2. Mo's Digital Pencil #18 - we were to use pink, white, red and include a heart. 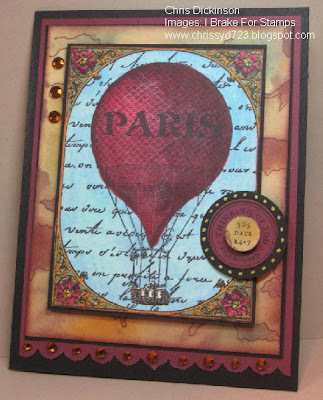 I used the Technique Junkies newsletter for this card and used TWO techniques! The first technique is the Sanded Whitewash from the Aug/ September 2009 newsletter and the Wisped Frames from the Feb/ March 2010 Newsletter. Accessories: Stippled Brush, Sizzix floral folder, Big Shot, Gesso, Sanding block, Paper piercing Tool, Flower punch, Dew Drops, Mini Glue Dots, Scallop Punch, Circle cutter, Dimensionals, ribbon colored with Copics. Hello! Thursday was quite the busy day for me. I had started the background last night, but pooped out and never finished it. So today, I worked in 10 minute spurts in between all of my running around. We were in and out all day and evening. Literally not even home for more than an hour from 9 am until 8 pm. Here is the background BEFORE I put the card together. I love the soft colors and was pleased as pie with how it turned out. MOJO WOOD - SISTERS IN BRAYERED BRILLIANCE! Happy Wednesday! For those of you following my weight loss, I am changing my weigh in day to Friday. One thing I have realized in a bad habit of weighing myself every day... is that I jumped back on program on a Friday after the Christmas holiday. Fridays tend to be the days I have a decrease in my weight, rather than Wednesdays. So I decided to switch it to that day! SO be on the look out for that on Friday. I can tell you though that so far I am DOWN this week. Woohoo! Ok - now about my card - I LOVED the MOJO Sketch this week, and made another card you can see HERE or I will be posting it on my Blog next Wednesday too. 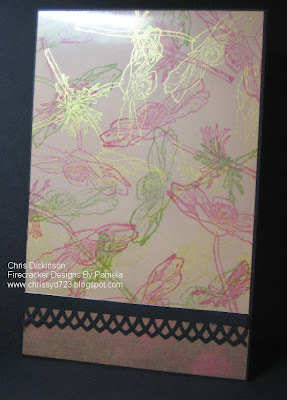 The Background on this card is a Technique Junkies technique from the February/ March 2010 newsletter called Brayered Brilliance and Pierced Patterns. Super easy and FUN too! Another challenge - Mo's Digital Pencil Too Challenge #17 was to create a project with WOOD or WOULD or FAUX WOOD - this bench has WOOD in it. You can see another project I created for this challenge HERE. Another challenge was the Stampers Sisters in Christ - to use TWO of the same type of item to TWO kinds of each item to make your ONE creation. 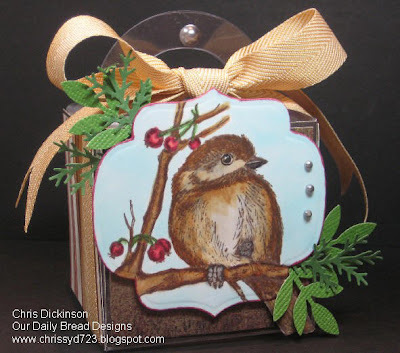 An example would be as follows: 2 different colors of cardstock, 2 different pieces of patterned paper, 2 pieces of ribbon, 2 brads, 2 buttons, and so on. My project uses TWO TECHNIQUES! HERE is the direct link to this challenge. Thanks so much for taking a peak and leaving me a comment! I appreciate your kindness! have a fabulous day! 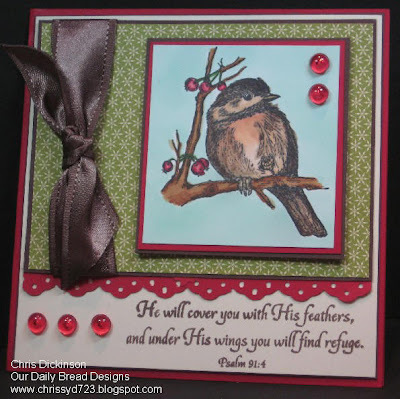 I created this card for the Our Daily Bread Designs Shining Light Challenge. We were supposed to use hearts, so I added the brads. 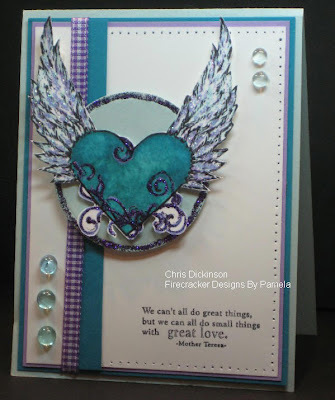 This card uses the MONO DIES and Wisped Frames technique from the Technique Junkies Newsletter. Hello Friends! Here in Wisconsin we are getting a big Snow Storm! It has been so brown and cold here in SE Wisconsin, that frankly I am THRILLED to see the snow...Plus that means I can lay low and RELAX today. Wait...I do that most days! LOL I actually have a really laid back schedule this year which I am LOVING! I have said NO to many things to slow down my pace and enjoy that quiet time with my family and the kids. I LOVE IT!!! There is only one day a week that I am running a lot with the children and that is Thursdays. Today the kids will be making Valentine's for a party we are going to on Thursday! That will be LOTS of fun!!! Thank you for taking a closer look and commenting! Have a great day! BLOGGERS CHALLENGE and a FEW MORE TOO! BELLI CHALLENGE #84 - RIBBONS!